We are excited about the Geneseo's recent transition to Handshake - a modern platform for students to find jobs and employers to recruit current students and alumni. Handshake replaces KnightJobs. Students, for more information about Handshake, see the Career Development page here. Handshake login guide for students is now available. 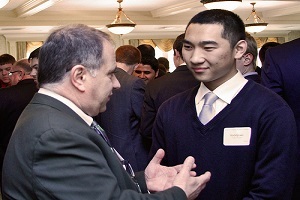 On campus employers new to Handshake, please contact ses@geneseo.edu for a special Handshake link. Employers new to Handshake, visit Handshake's Employer Site. Check out Handshake two-minute training video for employers. Handshake makes it easy to report your hires. Please assist us in collecting data about job posts filled by SUNY Geneseo students. "Student Employment Service (SES) at SUNY Geneseo acts only as a referral service. SES makes no recommendations or guarantees about positions and employers listed through this office. SES is not responsible for safety, wages, working conditions, or other aspects of off-campus employment. Due to the volume of jobs received by SES, we are unable to research the integrity of every position listed. Therefore, students are urged to take on this responsibility themselves. We encourage students to use common sense and caution when applying for any position. Do not feel pressured to provide sensitive, personal or financial information." Please see our posting GUIDELINES.